A media group which runs newspapers, radio stations and websites in Kent is to cut 61 jobs, blaming the poor economic climate. 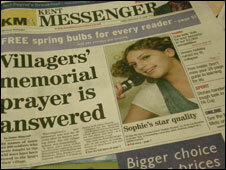 KM Group, publisher of the Kent Messenger newspaper, said its revenue had dropped by between 25% and 30%, costing it £9m in a year. The company told staff on Monday it was closing six of its smaller offices and restructuring its editorial operation. It said it would offer professional help to those whose jobs were at risk. "We hate to make anyone redundant but we have no alternative given the drop in our revenues if we are to maintain the strength of the company in the future," chairman Geraldine Allinson said in a statement. A consultation period with staff will continue until the end of October. Ms Allinson said that if the job cuts went ahead, the family-owned company would still employ more than 580 people. Offices put forward for closure are Dover, Faversham, Sittingbourne and Tunbridge Wells, along with its kmfm radio studios in Maidstone and Tonbridge.